When you hear about fundraising, you usually hear stories about the nonprofit fundraisers. In these stories, nonprofit companies hold a fundraising event in order to make money for something other than the company itself. These fundraisers are often filled with events, awareness ribbons, and other swag to make people realize they made a difference. It’s also possible that someone outside of the company will hold a fundraiser in order to help raise funds for a certain nonprofit’s cause or practice. However, nonprofit fundraising isn’t the only fundraising opportunity available. Sometimes a company needs a little financial help, and when this happens, for-profit fundraising is a viable option. Small businesses are usually in need of cash, and they often have a harder time accessing cash from usual sources, such as company equity or business loans. For this reason, many small businesses often turn to for-profit fundraising in order to receive the cash they need for success. 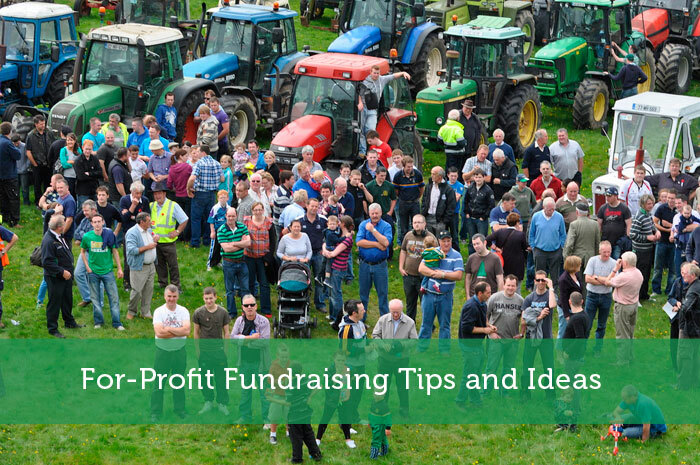 If you’re interested in fundraising for profit, use the following tips and ideas for help along the way. Be prepared with a plan. Before you decide to ask someone for money, you need to have a plan in place. Most people are not willing to hand over cash if you’re not entirely sure what you’re going to do with it. Make sure the individual sees what their money will be used for and why this is an essential part of your company’s plan for success. Along with detailing your use of the money (and how much), you also need to be prepared to give them something in return. You are going to be hard-pressed to find someone willing to give you money without getting anything back in return. For some people, they may be willing to give you a loan and are just looking to earn their money back in a given time period, usually with interest. If this is your plan, know how long it will take you to pay them back as well as how much interest you are willing to give them. Other individuals want to give you money for a stake in your business. For example, someone may provide you with money for a certain share of your company’s stocks or for a certain percentage of ownership. Again, if this is your plan, know the best options for your company. Aside from simply asking people for money, you need to think of unusual ways to try and fundraise some money for your business. Maybe you should start an online fundraising campaign through popular sites like GoFundMe. You can also simply add a “donate” button to your website in hopes that some of your web visitors will help you out financially. Another tool is to use the power of social media. Reach out to your followers and fans and let them know that you are looking for funding for a certain product, idea, etc. You may be surprised how much your customers are willing to help you out if you simply ask for it. Although you hope that everyone wants to hand your company money, it’s not realistic all the time. There are people out there who are going to turn you down, and there are some who may think less of your business for having to ask for money. Don’t let this get to you. Instead, use it to fuel the fire. Use the money you collect to make smart business decisions and create the success you hoped for. This is the best way to show those who snubbed you what they missed. It definitely takes some work but for-profit fundraising can and does work. Make sure your idea is the best out there!